The outlook for most Asia Pacific banking systems remains stable, backed by the relatively favourable economic conditions. 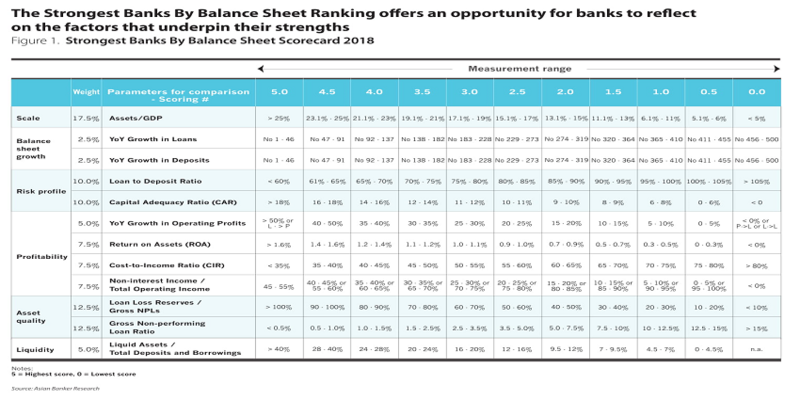 The strength score of the 500 largest banks in the Asia Pacific region averaged 3.15 out of 5 in this year’s The Asian Banker Strongest Banks evaluation, compared to 3.17 in the previous year. In general, banks scored lower in terms of balance sheet growth, loan to deposit ratio and liquidity. However, banks’ capital positions were strengthened in the financial year 2017 and their profitability was slightly improved. The evaluation is based on a very detailed and transparent scorecard that ranks commercial banks on six areas of balance sheet financial performance; namely the ability to scale, balance sheet growth, risk profile, profitability, asset quality and liquidity. Bank of China (Hong Kong) once again topped the annual ranking of AB500 Strongest Banks, with the strength score increasing slightly from 4.46 in the previous year’s evaluation to 4.49. The top 20 strongest banks in the Asia Pacific region included ten Hong Kong banks, four Chinese banks, two Singapore banks, and one each from Australia, Brunei, Japan, Malaysia, and New Zealand. Banks in Hong Kong, Singapore and Australia achieved the highest weighted average strength score, at 4.10, 3.51 and 3.34 out of 5, respectively, except for Brunei, which has only one bank on the list. On the contrary, Bangladesh, India and Pakistan recorded the lowest average strength score, at 1.81, 2.07 and 2.66, respectively. Banks’ balance sheet growth varied across markets. The lower score in balance sheet growth is largely the result of slower growth in markets such as Malaysia, New Zealand, Japan and China. The weighted average loan growth of Malaysian banks on the list dropped to 2.4% in 2017 from 5.2% in the year before, driven by weaker business loan growth. Banks in China saw their weighted average asset growth contract considerably from 15% in 2016 to 7.5% in 2017, mainly due to the regulatory tightening of shadow banking and interbank activities. However, their average loan growth only slowed down slightly. Balance sheet growth accelerated in markets like Hong Kong and Thailand. On average, Hong Kong banks on the list posted an 15.4% growth in net loans in 2017, compared to 3.2% in 2016. The significant improvement can be largely attributed to increased lending to corporates in mainland China and strong demand for mortgage lending. The loan growth of Thai banks improved in 2017, as the growth of automobile loans and lending to small and medium enterprises accelerated amid economic recovery. Capital positions of Asia Pacific banks broadly improved in 2017. Indonesian banking sector recorded the highest capital adequacy ratio (CAR), supported by strong profitability and decline in credit costs. The weighted average CAR of Indonesian banks on the list went up to 22.4% in 2017 from 20.5% in the previous year. Meanwhile, banks in Hong Kong, Malaysia, Singapore and Thailand enjoyed high capitalisation ratios, which provides sufficient buffers against risks. However, the capitalisation of Vietnamese banks remained weak, partially due to the strong balance sheet growth. In late 2017, Orient Commercial Joint Stock Bank become the first Vietnamese bank to apply for Basel II standards. Vietnamese banks need to raise a substantial amount of capital in order to meet Basel II compliance requirements, which will take effect by 2020 in Vietnam. Banks in India were also not sufficiently capitalised. The weighted average Tier 1 capital ratio and CAR of Indian banks on the list were 11.3% and 13.5%, respectively. Despite of the significant capital injection from the Indian government into Indian public sector banks, the tier 1 capital ratio of seven public sector banks was still lower than 8%. More capital is needed for Indian banks to meet regulatory capital requirements. The Indian government will be under pressure to infuse more capital than planned earlier, as it’s hard for banks to raise enough capital from the markets. Banks’ asset quality remained stable or showed signs of improvement in most Asia Pacific markets, with the exception of countries like India, Singapore and Malaysia. The average gross NPL ratios of banks in New Zealand, Australia, Hong Kong and South Korea remained below 1% in 2017. The asset quality of Philippine banks was broadly stable, backed by prudent lending regulations, although increased exposure to the real estate sector remains a potential risk. Their average gross NPL ratio and provision coverage ratio improved in tandem in 2017. In China, the overall asset quality of banking sector has stabilised in line with the moderate but steady growth in the economy. However, banks’ asset quality pressures persists, especially for those regional banks. The weighted average gross non-performing asset (NPA) ratio of Indian banks on the list deteriorated to 11.4% in the financial year that ended on 31 March 2018 from 9.1% in the previous year, because of the stricter norms on bad loans. Singapore banks reported higher gross NPL ratios, triggered by their their exposures to the troubled oil and gas segments, but their asset quality remained relatively healthy. The outlook for most Asia Pacific banking systems remains stable, backed by the relatively favourable economic conditions. However, concerns remain. Key risks affecting the operating performance of banks in the region overall include high private sector indebtedness, elevated property prices, trade war between China and the US and the the potential for rising US interest rates.